Competition: we have teamed up with The Architecture Foundation in London to give away five copies of their book Union Street Urban Orchard, which charts the transformation of a disused London plot into a public garden. The project was orchestrated by Heather Ring of the Wayward Plant Registry and The Architecture Foundation, and opened in July 2010 as part of the London Festival of Architecture. The book tells the story of the project and contains essays from those who made it happen. This competition is now closed. Five winners will be selected at random and notified by email. Winners’ names will be published in a future edition of our Dezeenmail newsletter and at the bottom of this page. Dezeen competitions are international and entries are accepted from readers in any country. Welcome to the The Urban Orchard Book! 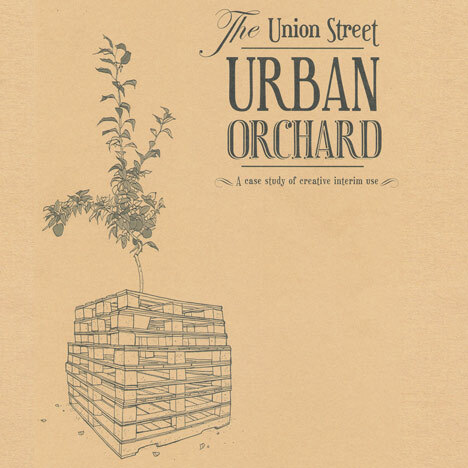 This book celebrates the Union Street Urban Orchard, a project that ran for four months over the summer of 2010. It aims to document the process by which it was conceived, constructed and used and to present the Urban Orchard as a case study to inspire others to think creatively about how empty spaces in the city can be used. It looks to provide useful tips and design advice as well as offering pointers on how to recreate some of the elements of the Urban Orchard. It presents the project from different points of view, from the landowner to the designer to the volunteers showcasing the people and challenges involved in making a project like this happen. Building a community garden and orchard with 85 fruit trees from scratch is no mean feet and in our case would not have been possible without the work and commitment of many hands. The Urban Orchard showed the potential of a forgotten part of the city, a disused site that had not been open to the public since it’s previous incarnation as the Southwark Lido in 2008. It proved not just that growing your own could be easy but also that a space that was designed on a human scale with flexible uses could provide the perfect ‘place of exchange’ for the local community to mix with visitors to the area. With a special series of events curated from June – September 2010 the Orchard managed to attract over 10,000 visitors and became a much-used space by those from the local community and beyond. It is hoped that this book will allow others to experience and learn from the project and open up debate and further possibilities of creatively using lost spaces. Subscribe to our newsletter, get our RSS feed or follow us on Twitter for details of future competitions. Congratulations to the winners! Tyler Blazer in Tennessee, Stefan Leiseifer in Switzerland, Fotini Anagnostou in Greece, Gary Rowe in the UK and Andres Rodriguez in Germany all won copies of Urban Orchard.